The content of this article provides interesting history, facts and information about the Roman Cohorts. The Roman Army was one of the greatest armies that the world has ever seen and its well structured organisation of the Roman cohorts ensured the efficient man-management of the soldiers. In the Maniple (Manipulus) system that existed before Marius, the men belonging to each legion were separated into four divisions. The most ancient standard used by the Romans was a handful (maniple) of straw fixed to the top of a spear. Therefore the company of soldiers belonging to it was called Maniple (Manipulus). The divisions were called the velites, hastati, principes and triarii. *** 1200 Hastati (raw troops). The soldiers of the first line, called Hastati, consisted of youths, who were distributed into fifteen companies, or maniples. The Hastati were so called because they were armed with the hasta, or spear. Each company contained sixty privates, two centurions, and a standard-bearer. Two thirds were heavily armed, and bore the long shield; the remainder carried only a spear and light javelins. *** 600 Triarii (veterans) The third body, the Triarii, was composed of tried veterans, in fifteen companies, the least trustworthy of which were placed in the rear; these formed three lines. The Triarii were armed with the pilum, four and a half feet long, of wood, with a barbed head of iron, so that the whole length of the weapon was six feet nine inches. Structural reorganization of the army and the Roman Cohorts was undertaken by Gaius Marius. Gaius Marius (157 BC–January 13, 86 BC) was a Roman general and politician elected consul. Marius made dramatic reforms to the Roman armies. The cohorts were adapted from the existing maniple system. The new cohorts eliminated the light-armed velites and created three groups of two centuries each with 80 men, for a total of six centuries ( 480 men). The Roman legion was divided into ten cohorts creating a force of 4,800 men. Eventually the century would be raised to its literal number of 100 and a legion consisted of of 6,000 men. Following the restructure by Marius the format was again changed so that the century would be raised to its literal number of 100.
Who was Who in the Roman Cohorts? 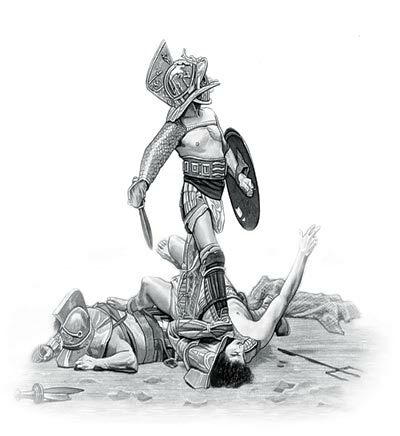 The Roman Cohorts were arranged in battle so that the experienced, inexperienced, strongest and weakest soldiers would be mixed throughout the battle formations maximizing moral and effectiveness. Each of the 10 cohorts were numbered and consisted of specific types of Roman soldiers. The organisation and numbering of the Roman Cohorts were the same throughout the different legions. Cohort I: The elite troops commanded by the Primus Pilus, the Legion Commander *** Cohort II: New and weakest troops *** Cohort III: No special designation for this unit *** Cohort IV: New and weakest troops *** Cohort V: Again, no special designation *** Cohort VI: Made up of "The Finest of the Young Men" *** Cohort VII: Newest and weakest troops including the Hastati (the raw troops) *** Cohort VIII: Contained "The Selected Troops" *** Cohort IX: Newest and weakest troops including the Hastati (the raw troops) *** Cohort X: Made up of the "Good Troops"
The main dependence of the Roman Cohorts was on the infantry, who wore heavy armor and protective helmets and carried a shield, a light spear called a pilum or javelin and a short cut-and-thrust sword with a double edge. An infantry unit was called a Cohors peditata. The cohortes equitates were the mixed cohorts of cavalry and infantry used in the first, second and third centuries AD. The cavalry attached to each legion consisted of three hundred men, who originally were selected from the leading men in the State. They were mounted at the expense of the State, and formed a distinct order. The cavalry was divided into ten squadrons. The Cataphractarii were heavily armed and armoured cavalrymen deployed in the 2nd Century AD. To each legion was attached ten military engines of the largest size and fifty-five of the smaller. All of these large weapons discharged stones and darts with great effect. The artillery were used both for hurling missiles in battle, and for the attack on fortresses. According to Publius Flavius Vegetius Renatus who was a writer of the Later Roman Empire and the author of De Re Militari (Latin "Concerning Military Matters") each century had a ballista, operated by a Ballistarius, and each cohort had an onager manned by libritors (artillerymen) and mounted on wagons drawn by oxen or mules. The content of this Roman Cohorts category provides free educational details, facts and information for reference and research for schools, colleges and homework. Refer to the Colosseum Sitemap for a comprehensive search on interesting different categories containing the history, facts and information about Ancient Rome.